AUDIOSLAVE will reunite for its first performance in over a decade on Friday, January 20 at the Teragram Ballroom in Los Angeles for the Anti-Inaugural Ball, protesting President Donald Trump's inauguration. Also scheduled to appear at the event are PROPHETS OF RAGE, Vic Mensa, Jackson Browne, Jack Black and The Los Angeles Freedom Choir. 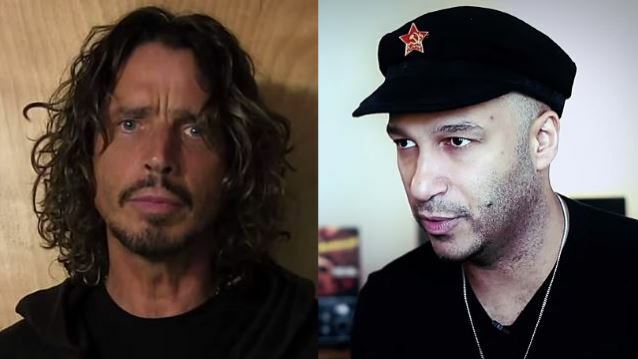 AUDIOSLAVE featured SOUNDGARDEN singer Chris Cornell alongside RAGE AGAINST THE MACHINE guitarist Tom Morello, bassist Tim Commerford and drummer Brad Wilk. Morello discussed the possibility of an AUDIOSLAVE comeback during a recent interview with Music Radar. "I love Chris and I love what we did together," he said. "That door has certainly never closed in any way, but right now, it's looking like we're pretty busy. We're in the middle of a North American tour [with PROPHETS OF RAGE], I'm also working on a record of my own and the other guys have things going on, too. But whatever happens in the future, Chris is one of the greatest singers of all time, and there's no way I couldn't be proud of the shows and music we played together." Cornell told U.K.'s Total Guitar magazine in 2015 that he would also be open to an AUDIOSLAVE reunion. He said, "I think it would be great. We did a lot of songs, and with the benefit of not having done anything with those guys for so long, I can't imagine what it would be. It would be a really amazing experience just to get back and work with the same guys again." Cornell continued, "We were certainly a prolific group of people; we wrote three whole albums in around five years, maybe less. And these were albums that were raw, and we had extra material, and we just never seemed to have trouble ever trying to agree on what would come out of the songs." He added, "They were great guys, and I really enjoyed the experience that I had with them, so yeah, I would always be open to doing something." AUDIOSLAVE came together in 2001 when Cornell teamed with the instrumental members of RAGE AGAINST THE MACHINE. After the break-up of SOUNDGARDEN in 1997, Cornell attempted a solo career which didn't catch fire at the time. AUDIOSLAVE made three albums, a self-titled 2002 debut, 2005's "Out Of Exile" and 2006's "Revelations", before Cornell left the group in 2007. He eventually reunited with SOUNDGARDEN in 2010, while RAGE AGAINST THE MACHINE intermittently performed live between 2007 and 2011. Morello told The Pulse Of Radio not long after AUDIOSLAVE's demise that he had no hard feelings against Cornell for quitting. "You know, Chris I consider a good friend and I love that guy, you know, and we went through a lot together, both musically and personally," he said. "And it was, you know, my belief that the band's friendship and roots were deep." Cornell made a guest appearance in September 2014 during a performance by Morello at the El Corazon in Seattle.